Today, a story for anyone who's been to Galveston. The University of Houston's College of Engineering presents this series about the machines that make our civilization run, and the people whose ingenuity created them. We've been making concrete ships, on and off, for a long time. The French inventor of ferrocement built a concrete dinghy for the 1855 Paris Exhibition. By the early 20th century, several countries had built working barges of concrete. And today, civil engineering students all over America compete yearly to see who can build the best steel-mesh-reinforced concrete canoe. It was the shortage of steel during WW-I that finally drove American ship-builders to making concrete merchant vessels. A Norwegian builder demonstrated that he could make a small ocean-going concrete vessel in 1917. The US Government immediately hired him to help build 24 concrete merchantmen. Meanwhile, an California shipyard launched its own 300-foot concrete ship. The government finished only twelve of its concrete ships, and that was after the war ended. They sold them off to private companies. The largest two were identical oil tankers, just over four hundred feet long, built in Mobile: the SS Latham and the SS Selma. On the Latham's first trip, she carried oil from Tampa to Philadelphia. Then she struck a jetty on the way back, and managed to limp into Galveston for repairs. She ended her brief career as a floating oil tank near New Orleans. The SS Selma did better. She served several coastal ports until she too hit a jetty, this one outside Tampico, Mexico. She suffered a 60-foot crack in her side and had to be towed into Galveston. She could've been repaired; but no one there knew how to mend a long crack in a concrete ship. So she sat in Galveston until 1922 when officials finally decided to scuttle her. But Galveston Bay is quite shallow where it hasn't been dredged out for ship traffic. It wouldn't do to scuttle her in shallow water where she'd be a hazard to boats, or in channels cut to fit ocean ships. The solution? Dredge a long trench, 25-feet deep, into the very shallow shelf off Pelican Island, just North of Galveston. Tow the Selma into that trench and leave her where she'd be visible and a danger to no one. And that's where she sits today -- just east of Pelican Island. She's a wreck, no doubt about that. But her concrete hulk remains remarkably intact after a century. And if you know the Houston/Galveston area, you might've noticed her. The Bolivar Peninsula Ferry passes 800 yards east of her, while passengers ask one another, "What in the world is that?" It is, of course, the ghost of a living idea. Did you know that another 24 concrete merchant ships, built during WW-II, did much better? Concrete ship proponents still flourish. 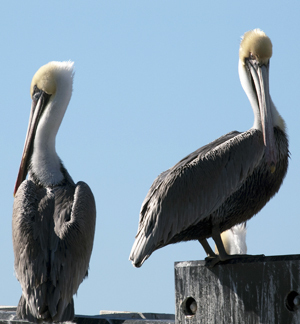 So look toward Pelican Island as you ride the Ferry. Just beyond the playful breaching dolphins, stately pelicans, and hungry gulls, lies the ghostly Selma. Her unlabeled hulk, circled by fishing boats it's a sight guaranteed to trigger our what-if imaginations. For more on the SS Selma and concrete ships, see the crystal beach page on the Selma and the absoluteastronomy.com page on Concrete ships. See also Engines Episode 2211. All photographs taken by J. Lienhard, either from the Bolivar Ferry or from Pelican Island. 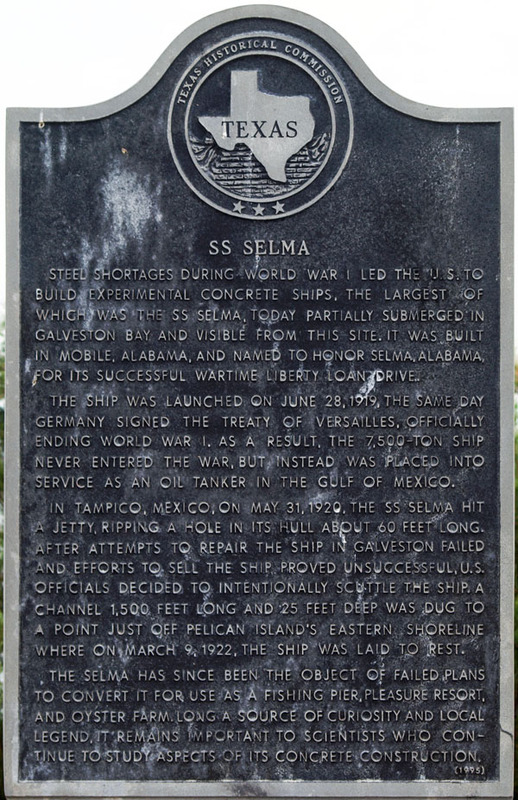 I know of one plaque for the SS Selma. But it's located in a spot on the east shore of Pelican Island that few people ever get to see.